Speedwells (Veronica spp.) 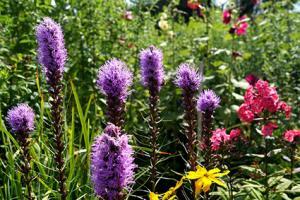 are carefree perennial flowers that come in a variety of forms and have a corresponding variety of uses. Ranging from four inches tall to four feet tall, speedwells are used in perennial borders, as groundcovers, in planters, and for a variety of other landscaping applications. Many species of Veronica are found in garden centers, some of which differ drastically in appearance, making it confusing to sort them out at first. 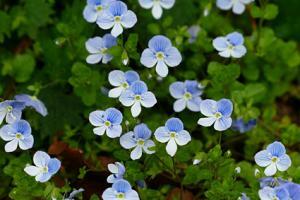 It helps to know that the speedwell varieties fall into two main categories. There are the tall, upright types, which have thin vertical flower spikes composed of hundreds of tiny flowers; and there are low, spreading types, which are covered in much larger, single flowers. Veronicas are most often seen in blue or purple though white and pink forms are also available. Despite the variations in growth habit, Veronicas all like the same basic conditions in the garden. They grow best in full sun or partial shade and are happy with a moderate irrigation regime. They are not picky about soil, growing just fine anywhere that is not horribly infertile or poorly drained - that being said, they respond well if planted in a bed of rich soil and will flower more profusely in these conditions. The taller, upright speedwells are primarily used in perennial borders, where they are often seen with butterflies fluttering around them. However, the shorter forms of this category are suitable container plants for a deck, balcony, or patio. The low, spreading speedwells are a useful small scale groundcover, some of which are tiny enough to use between stepping stones. They are also a great edging plant for making a border along a pathway or to frame a bed of taller perennials. They are wonderful for creating low tufts of foliage in potted arrangements to complement a taller, upright specimen. The foliage will spill over the edge of a planter or a wall if planted with this intent in mind. Finally, these smaller speedwells are often used in rock gardens. Veronicas are typically planted in fall or spring. Irrigate them on a weekly basis unless there has been a soaking rain. Veronicas start flowering at different times of year, but all will bloom repeatedly if the spent flowers are removed. The tallest varieties may need staking. Cut the plants to within a few inches of the ground after the first hard freeze of winter and cover them with a thin blanket of mulch - they will re-emerge every spring. 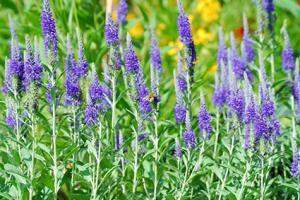 Every three or four years clumps of Veronica can be divided and transplanted. Speedwells are prone to many of the minor pest and disease problems that affect most perennials from time to time, such as aphids, powdery mildew and mites, but these are usually not serious enough to cause more than a temporary setback to the plants. One more serious problem to watch out for, however, is leaf spot - small circular marks that appear on both sides of the leaves. Leaf spot can be quite contagious and can kill numerous plants very quickly if not addressed. The leaves become overrun with the spots and will shrivel and die. The best treatment is to remove and destroy infected plants before the disease spreads. Makes sure to clean up all the dead leaves, rather than leaving them on the ground where they can become a vector for the disease. Speedwell is common in garden centers everywhere. 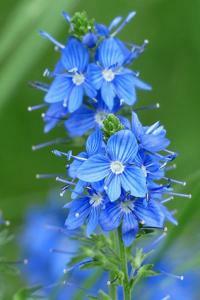 'Sunny Border Blue' grows to two feet with 10-inch spikes of electric blue flowers in summer. It's hardy in USDA zones 3-8. 'Rosea' is similar but grows to three feet and has pink flowers in summer. It's suitable for USDA zones 4-8. 'Georgia Blue' is a six-inch groundcover bearing sky blue flowers with a white center in spring. It's hardy in USDA zones 5-8. 'Tidal Pool' grows just two to three inches tall with blue and white flowers in spring. It's suitable for USDA zones 4-8. Veronicas have been used throughout history for a variety of medicinal applications, especially respiratory problems and ailments of the cardiovascular system. 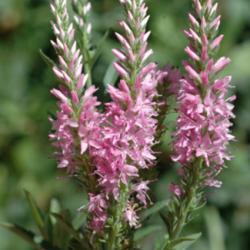 The plant is commonly incorporated in herbal teas to this day. Keep in mind, however, that the ornamental cultivars found in garden centers do not necessarily possess the medicinal properties associated with some wild species of Veronica. Veronicas are very reliable garden plants. Their flowers border on stunning, especially when planted in mass, and they are very forgiving when it comes to soil quality, occasional lapses in watering, or other innocent mistakes of a busy gardener.